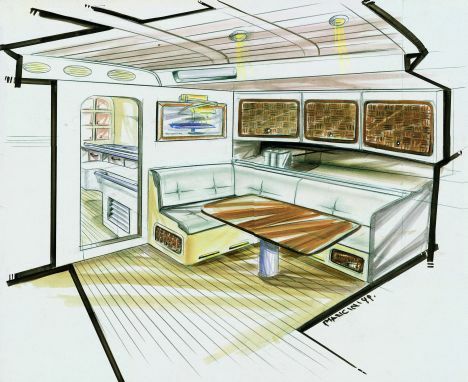 I have been often asked the reasons for my building the sailing yacht "Rivolta 90". The answer is rather complex for at the basis of this decision there are two quite different reasons. The first one is very personal and is linked to my past while the second one is dictated by the experience I gained on the numerous boats of different type and size that studded my life. Let us start with the first reason. In the Sixties and Seventies, among other things, I built "Iso-Rivolta" cars and I made them just as I wished them to be, running all commercial risks. Years later, I collaborated in the manufacturing of cars for large companies. I found the job very boring. In fact, in most cases, the car had become a product of committees, which first of all had to evaluate the financial risk. The initial investments needed to obtain a low-cost item produced on a large-scale are very high. Very innovative cars are synonym to very high risks. Result: sometimes one has to read the name to recognize the model. Nevertheless, the car is considered a necessity while the boat is a pleasure item as were the sports cars with the capital "C" in the Sixties. Large shipyards suffer more or less from the same problems when they want to obtain cheap products with large-scale productions. In the case of cars the extreme automation, the considerably high sales and all regulations made the appearance of a market niche impossible unless it is supported by billions of euros or dollars and backed by a large company. In the nautical sector, the survival of small yards is still possible. The production of boats is not as large and the type of construction does not allow excessive automation especially for larger crafts. Therefore, in order to live the same feeling I had when I was young, I started building boats that my son and I believed might interest a group of persons who had tastes and experience similar to ours. Actually, I passed the 'virus' to my son Renzo who is now the main inspirer of our ideas. I also build condominiums, houses, shopping centers, but I do it according to the market requests of the place. Logically, by having this type of approach with boats I have to face difficult moments because, in general, the public opinion needs a certain time to adapt. It has always been a family problem, like "l'Isetta", the small city car my father built in the Fifties. The second reason is more concretely linked to the "Rivolta 90". I wanted a very fast yacht that could sail well close- hauled even in light wind. Inexplicably, when sailing, the wind is often light and comes from the boat's heading, therefore the speed of a boat intended for extended crossings is extremely important. An extra knot makes a great difference, as opposed to a motorboat for which motoring at 30 or 35 knots is not important, given the usually shorter distances covered, the effects of her banging on the waves and the need of refueling. 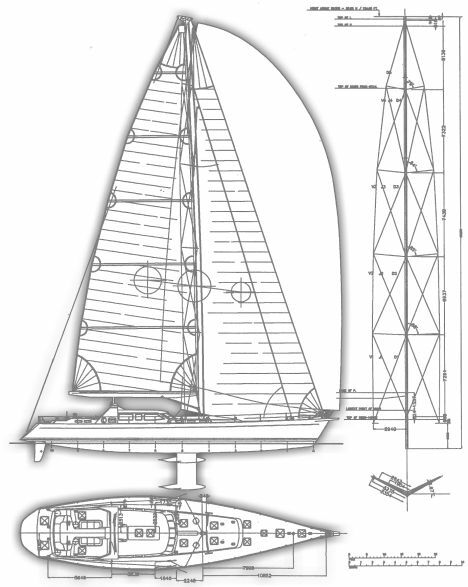 The "Rivolta 90" was designed to reach 20 knots in strong wind and favorable waves. So far, with the sea conditions I found, the boat reached a maximum of 16-17 knots and she sailed in light wind at 12 knots. Too often nature does not have half measures: in a stable and light wind, eventually after a lull, suddenly stormy wind and high waves appear. The boat must be able of smoothly coping with these conditions. She must be sturdy, well balanced and must protect the crew. She must have a good cockpit, well protected by some sort of superstructure and not with an open transom as is recently seen on some vessels. To make her more stable in strong wind and to be able to set as much sailcloth as possible for greater speed - which always helps to solve difficult situations and eventually escape from bad weather - she is fitted with two side tanks which extract 4 tons of seawater each. It is like having a crew of 40 that may be moved on the windward side in case of need. Unfortunately, against my will I found myself sailing in a hurricane in front of Cape Hatteras. Luckily it was a type 1 hurricane, but the Gulf Stream in that area is very strong and it created very high waves. I was heading north, where I wanted to show the boat and I thought of what I would have to repair on deck and belowdecks on arrival. Two days later, in harbor, I noticed to my great satisfaction that nothing was damaged. The hull was designed by S.P. System of South Hampton in England by knowledgeably combining carbon fibers, Kevlar, E-glass with epoxy resins so as to obtain a solid hollow shape. Bulkheads, berths and cabinets are also part of the structure thus eliminating the main deformations and usual creaks. Sturdiness and lightness are two essential features for seafaring. A sailing yacht of this size and performance should have a draft of approximately 13 feet. In many cases, this is a great problem: it limits access to some marinas, it prevents from visiting several areas (i.e. Florida and the Bahamas), it takes away the pleasure of going into small and agreeable inlets and of appreciating new places. The considerable draft makes your boat similar to a cruise ship that must anchor far from shore. In order to cope with this problem, the "Rivolta 90" is fitted with a stainless steel fin with a lead bulb (weighing approx.15 tons overall) which runs in a very thick trunk of carbon fibers and Orkot operated by two hydraulic pistons. It has four positions. The deepest one reaches 13 feet and the shallowest 5 feet and 7/8 in. When one chooses a position everything is bolted in place for safety and it integrates with the hull. The operation only takes a few minutes and is very simple. The boat is fitted with two carbon-fiber rudders and their draft is less than the shallowest position of the bulb. Moreover, two rudders offer greater safety: if one is damaged, the boat may be steered with the other one. I believe that speed is important even when motoring. If there is no wind: we may comfortably reach the anchoring in the shortest time possible. The "Rivolta 90" quietly cruises at approximately 12.5 knots without vibrations. It can reach approximately 14 knots. She is fitted with two 315 hp Yanmar engines and two Max Prop propellers, each mounted in front of a rudder. Steering is smooth and she may turn on itself with no need for a bow prop that would increase weight in the wrong area. She can sail with just one engine at 8.5 knots to save diesel or to safely enter a harbor or marina when one engine or propeller is damaged. Sailing must be a pleasure so the boat has to be comfortable with ample living spaces even if used, as I do, with a small crew. The different levels should be connected by way of a few steps - three for example - so that going from the cockpit to the solon and the cabins is extremely easy and inviting even in big waves. I think a large salon from which one can see outside and, possibly, steer or at least control the automatic pilot is extremely important. According to strange rumors a fast sailing boat must have a flush deck and a long ladder that goes down into the belly of the whale and must be uncomfortable. Performance is determined by weight, waterlines, sails and a myriad of other factors that have nothing to do with comfort. This is true even more today thanks to new materials and knowledge. Maybe the biggest problem nowadays is represented by the crew: where can one find efficient and pleasant persons with whom to share life on board? According to my experience, finding one is already a great success. For this reason the Rivolta 90 was conceived to be maneuvered and taken care of by a small crew. The aim was to have a 90-foot sailing boat with size and speed typical of her length but which could be used as a fifty footer. Usually I sail with my helpful deckhand. I sailed almost 4000 miles with my boat and I never had a crew bigger than three including myself. In order to obtain this result in addition to easy operation, maintenance should also be considered. If one sails extensively and mostly in warm seas where there are major humidity changes and the sun is strong, the first thing to do is to remove wooden details on the outside. 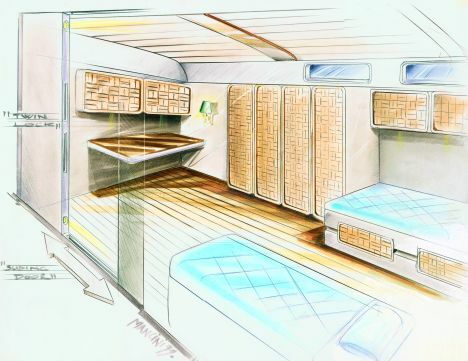 I know that for a small-production yacht, mainly built without well-defined molds, the temptation of covering the deck with a thin layer of teak is very strong: all imperfections remain below it, eliminating repair work, sand paper, layers of difficult paints. 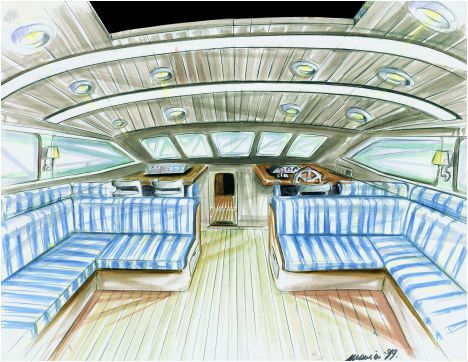 In addition everybody likes teak decks which also help to sell the boat at a more expensive price. The same may be said of details, which are easier to do in wood as unique samples, rather than with materials that would be more suitable for usage. Actually, sailors know that teak is nice to look at but is hot, dusty, difficult to keep clean, unpractical when going fishing and overturning greasy matter or diesel on it. In the old days it was a good material because this type of wood resists well to temperature and humidity changes and by sealing it with pitch the deck became quite watertight for a long time. Nowadays this problem does not exist. The deck is already sealed by a fiberglass resin or similar materials. A thin layer of teak is screwed onto the deck with fake seams of black synthetic material just to remind the old days, with no construction reason. All this is quite sad! But the most important factor is that the further from the surface of the sea the lighter the boat must be, and because of this the Rivolta 90 has a very light and sturdy carbon fiber deck. If it were covered with teak not only would one make a mistake in weight distribution but it would be like hiding in a wooden box a diamond that actually is made of carbon. To conclude this long chat I would like to reconsider my initial objective: to have a sailing boat with size and speed typical of a ninety footer but which can be used and maintained as a fifty footer, and above all which sails very fast and takes me home even with no wind, offering comfort and performance similar to a nice motoryacht. I wanted to change or better get rid of the concept of motor sailer that never worked. As a matter of fact, a motor sailer does not sail properly with wind and it motors even more poorly. Moreover, a nice slender line never damages. Looks also count and a nice boat should give the impression of being sailing even when anchored. Now it is up to public opinion to judge whether I succeeded and if there is a market for such a boat. The only thing I am sure of is that all those that I invited onboard as well as many journalists specialized in the nautical field were astonished by the boat's performances. In fact, the world press published many of the boat's sea trials. My role is simple. When I leave my berth in Florida and, with the keel up, I sail along canals or low lagoons to reach the Gulf of Mexico, or when there is no wind and we have to motor home at 12 knots I tell my guests "Welcome onboard the motoryacht Rivolta 90". When I reach the Gulf and find a light breeze, I lower the keel and unbridle the sails. The boat responds immediately with unexpected docility, taking the wind on her sails and sailing at a good pace and then I tell my guests "Welcome on a real thoroughbred sailing yacht, the Rivolta 90". I let the rest of the chat to the wine.